This is the story of two people - Molly (a foster care kid that has been troubled her whole life) and Vivian (a kindly old woman who is looking for some help around the house). Molly gets caught stealing a book from the library and is sentenced to community service hours. Her boyfriend gets her a job helping Vivian clean out her attic. 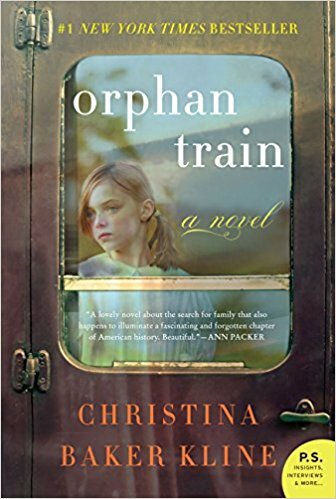 During the clean out, Vivian begins to tell Molly her story of being an orphan on the orphan train in the 1930s. Her entire family was killed in a fire and she was sent on a train to the midwest to be adopted by a family. What ended up happening is she basically became a slave for families who were looking for help. She meets a young boy her age on the train and helps care for a small baby. Her life for a few years is very hard. She finally is adopted by a nice family and marries, has a baby, and has a wonderful life. But she never forgets what happened to her. Molly and Vivian share a common background, and Molly soon finds a deep friendship with Vivian that she has never had with anyone else. This was a fantastic book. I love true stories, and this is a historical fiction story related to the actual orphan trains of the 20s and 30s. Most of those kids who were not babies were taken into families to be laborers, maids, or store workers. They were not adopted to be loved and cared for and they had hard lives. Many ran away or were killed or abused. I highly recommend this book. Check it out.